Back when we were kids, we used to love buying the latest stickers that were available so that we could stick it onto our books or the books of our friends, just so that we could show off how cool our collection was. There were a whole range of different types, from cartoon characters, to ones with googly eyes, to ones of little kids in awkward positions. Well, thanks to the Stickers slot game, you can relive those days of fun and frolic and watch the different coloured patterns spinning on the reels to make your fortune. Stickers is a video slot game that has been developed by NetEnt. NetEnt is a Scandinavian casino game developer that has taken personal pride in making some excellent games available to gamblers online. Thanks to their efforts, online slot games are just getting better and more full of life. With names like Starburst and Dazzle Me to their credit, you know that you are in for a great gaming experience when you play one of their slot games. 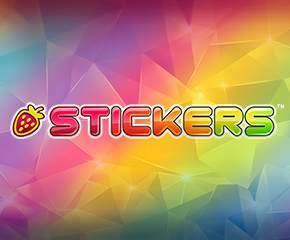 Stickers is a 5 reel, 20 payline video slot game that is based on the theme of fruit stickers that form the symbols on the reels. Just like stickers, you can see how colourful the various symbols are and each of them has a white border just like the bubble stickers that you used to play with back in the day. The game has a very upbeat jingle so that you can feel like a child again as you spin the reels. To start playing, you can choose the coin value you wish to start your wager with and then click the Spin button to start spinning the reel symbols. 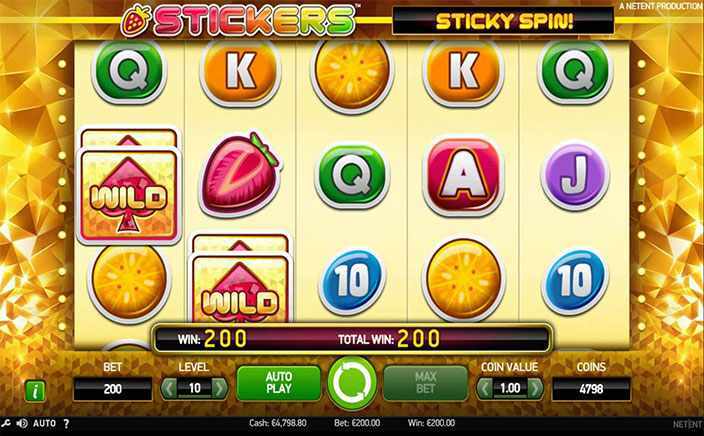 Sticky wilds: The sticky wilds feature is one in which you have wilds that stack up on the reels once you score a winning payline with the wild symbol. These then keep accumulating with every win so that you can enjoy more wins, and will stop once you do not get any more wild symbols. Sticky spins: With every sticky wild that you collect on the reels, you get one free spin. Once your wilds run out, so will your free spins. Stickers is a fun game to play if you are looking for a slot game where you can place low bets, and enjoy small casual wins as they come.